Attach an Xbox Live Vision camera to your Xbox 360 console to use video chat, attach pictures to messages, and add pictures to your profile. 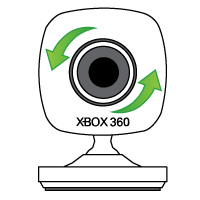 To set up the Vision camera, connect it to the Xbox console, and specify your Online Safety and Privacy settings. Use your Vision camera with Video Kinect to have live video conversations with your Xbox Live friends. 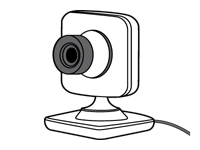 Make sure to set up Video Kinect before you use it with your Vision camera. Go to My Friends, select the friend that you want to video chat with, and then select Video Kinect. Go to Apps and select My Apps. Select Video Kinect, select More Friends, and then select a friend.